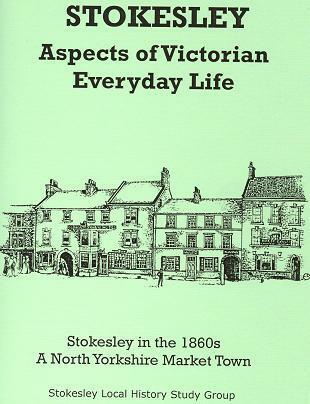 £5.95 plus £1 p&p - special offer of £10 plus £2 p&p includes this publication plus "STOKESLEY - Further Aspects of Victorian Everyday Life"
This was originally published in 1995 as "Stokesley in the 1860s"
This book paints a picture of Stokesley, far removed from today. True, the outward appearance has changed very little, but the use is very different. "Stokesley, the Metropolis of Cleveland"; so quotes a newspaper of the day, and so it was, with 13 grocers, 21 butchers, 7 dressmakers, 6 drapers, 10 tailors, 13 shoemakers, a hatter, 5 solicitors, and 2 watchmakers, one doubling up as the local dentist! It contains a fascinating insight into everyday life in Stokesley in the 1860s. Where else could one read about Mr. Mosley, sole inventor and Patenter of an "Improvement in the Construction of Artificial Teeth, Gums,and Plate", for which Her Majesty had granted Royal Letters Patent, who claimed "restoration of decayed and tender teeth to their former glory", and, where this was impossible, "beautiful new dentures free from wires or springs." New illustrations drawn by our member Estelle Scott, who is a retired art teacher, enhance the text.